Transistor is a semiconductor device used to switch or amplify electrical power and electronic signal. In our previous tutorial, we explain how to use a transistor as an oscillator and as an amplifier. 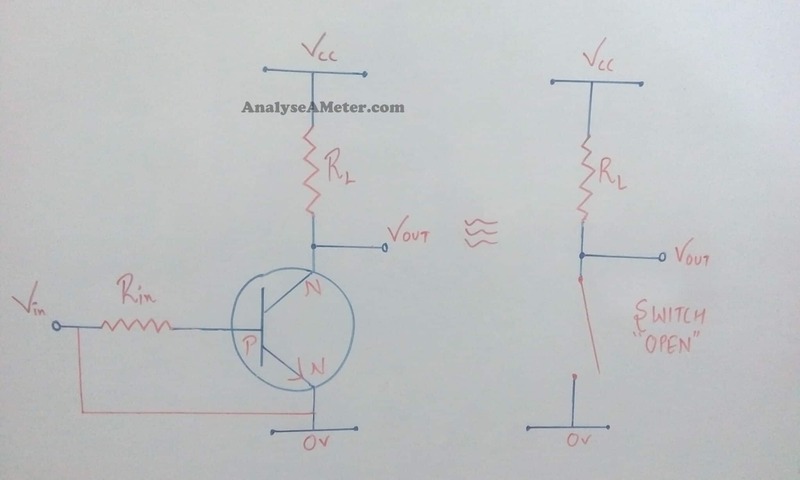 Here we are going to explain to you how to use Transistor as a switch and testing a transistor using multimeters & switching circuits. When we use switching transistor, the transistor base biasing voltage is applied in such a way that it always operates within its Active region. Therefore, both npn and pnp type of transistors can be made to operate as On/Off type solid state switches by biasing the transistors base. Nowadays we can use transistors as a switch because transistor switches can be used for controlling high power devices such as solenoids, motors etc and also in digital electronics and logic gate circuits. 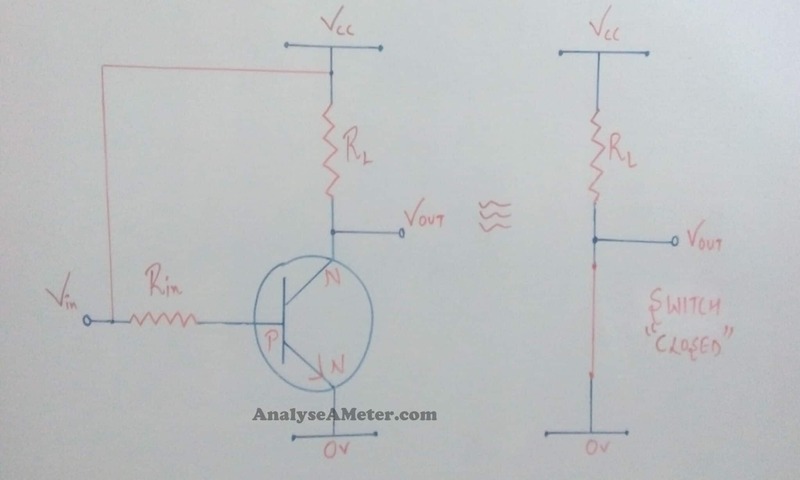 If you want to use Bipolar Transistor as a switch in any of the electronic circuits, then you have to arrange the biasing of the transistor either NPN or PNP in such a way to operate the transistors at both sides of the I-V characteristics curve. Transistor as a switch basically operates in two regions; one is Saturation region and other is Cut-off region. (i) Saturation Region: For the supply of a maximum amount of base current we basically biased the transistor into this region. 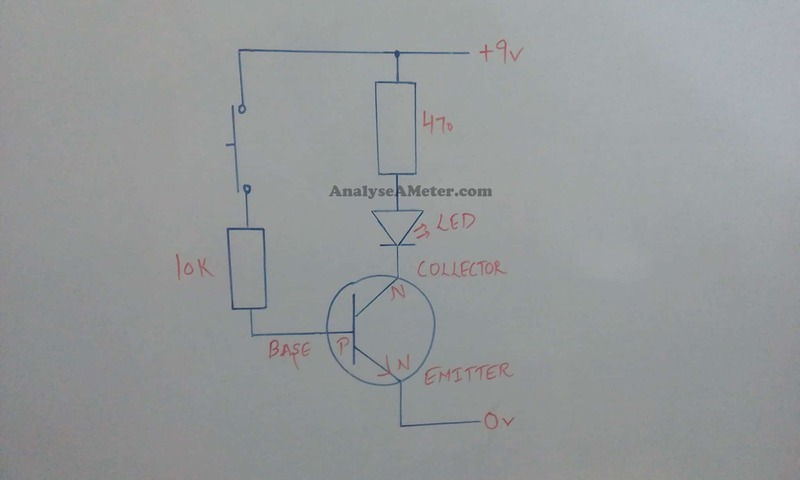 It results into maximum collector current and minimum collector-emitter voltage drop which further results into the depletion region being as small as possible which makes the maximum current flowing through the transistor. Therefore, the transistor is switched ‘Fully-On’. Base-Emitter junction is always forward biased. Always connect the input and Base to VCC. Base-Collector junction is always forward biased. 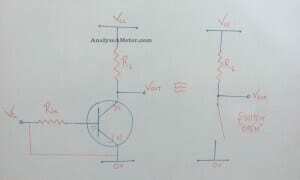 Base-Emitter voltage is always greater than 0.7 V i.e. VBE> 0.7v. Transistor is “Fully-ON” in the saturation region. (ii) Cut off region: The operating conditions of transistors in this region are zero input base current (Ib ) , Zero output collector current ( Ic ) and maximum collector voltage which results in a large depletion layer and no current flowing through the device. Therefore, the transistor is switched ‘Fully-Off’. Always connect the input and Base to the ground. Base-Collector junction is always reverse biased. Base-Emitter junction is always reverse biased. Base-Emitter voltage is always less than 0.7 V i.e. VBE< 0.7v. Transistor operates as an “open switch”. In this region, no collector current flows i.e. Ic = 0. In many circuits, you can use transistors as a “single pole single throw” solid state switch. When we apply zero signal to the base of the transistor, it turns “off ” and acting like an open switch which results in zero collector current flows. Similarly, when we apply positive signal to the base of the transistor, it turns “ on” acting like a closed switch which allows maximum current flows through the device. 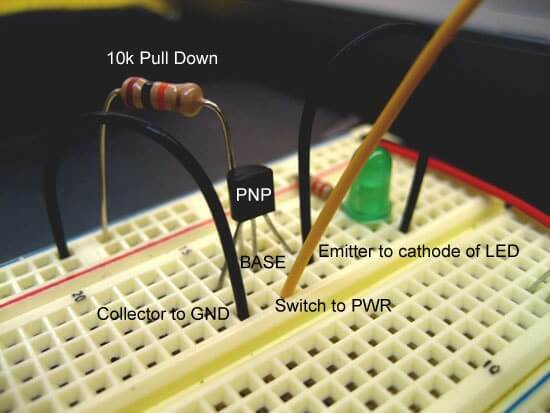 As shown in Figure below, connect the NPN transistor in the circuit which uses it as a switch. Apply voltage is not critical so selects the suitable voltage in between 5V and 12V. Always include 10K ohm resistor in base connection to protect your transistor from excessive current. When the switch is pressed, the LED turns on indicates that the transistor is ok while when the switch is released the LED turns off indicates that the transistor is not ok. Note: If you want to test the PNP transistor then use the same circuit but reverse the LED and the supply voltage. 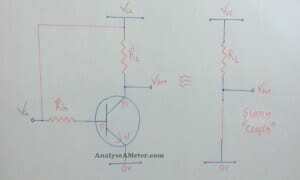 The Base-Emitter junction should behave like a diode and conduct in one way only. 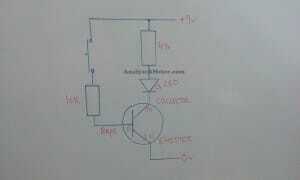 The Base-Collector junction should behave like a diode and conduct in one way only. The Collector-Emitter junction should not conduct in either way. You can check either NPN or PNP transistors with the help of multimeters. Our pleasure. Thanks for reading. Keep visiting our site for more information.